As 2015 to comes to a close, it’s time to fill the coffers to keep the content humming into the New Year. With your support, FSRN will continue to bring you reporting without corporate influence and no political pressure. FSRN provides uncensored media space for reporters across the U.S. and around the world who seeks to tell the stories of regular people, elevating voices generally ignored. We have a number of ways to thank you for your year-end, tax-deductible contribution. In addition to the Shannon Young’s 2016 FSRN Oaxaca Street Art Calendar and Lena Nozizwe’s photo-documentary of the post-Ferguson #BlackLivesMatter movement, just yesterday we received permission to offer you “Rebel Reporting, John Ross Speaks to Independent Journalists.” With an introduction by Democracy Now!’s Amy Goodman and foreword by media scholar, former FSRN Board Member and Free Press founder Robert McChesney, Rebel Reporting is truly a “manual of style” for grassroots journalists and a compelling read for anyone interested in independent media. 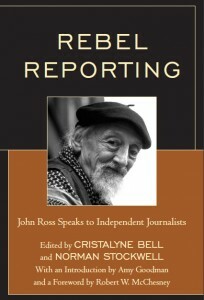 Written in the powerful voice of the late John Ross, the book contains a series of lectures on how to do “Rebel Reporting,” followed by an example of how it is done through the story of the murder of Indymedia reporter Brad Will. The book concludes with an appendix crafted by former FSRN lead producer Catherine Komp, with assistance from WORT reporter Laura Brickman, that will serve as a useful toolkit for any reporter. The book showcases the importance of independent media outlets like Free Speech Radio News in bringing real stories to light in spite of a commercially dominated media landscape. For more on Ross and the evolution of “Rebel Reporting”, see this book review in the Tico Times which features an interview with the book’s co-editor Norman Stockwell, a long-time FSRN contributor. You’ll find more information about “Rebel Reporting” as well as our other thank you gifts on our 2015 Year-End Donate page. Support alternative, independent media that’s not afraid to encourage the type of journalism practiced by reporters like John Ross who seek to detail world developments as they affect everyday people across the globe.